The EcoSmart PAR20 7-Watt LED Light Bulb can be used to replace an traditional 50W halogen PAR20 light bulb. This LED light bulb has an output of 450 Lumens and can last up to 25,000 hours, saving you up to $118 per bulb over the bulb's life. And it is ideal for use in track or recessed lighting fixtures. The Ecosmart 50W Equivalent Bright White (3000K) MR16 LED Flood Light Bulb (6-Pack) is ideal for both accenting and general room lighting. It is instant-on and will not fade fabrics or furnishings. The LED bulb offers energy savings and long life. It is an energy-efficeint replacement for 50W halogen bulbs. Energy Star qualified. The Ecosmart 60W Equivalent Amber (2200K) ST19 Dimmable LED Light Bulb (3-Pack) has an antique glass filament. This LED bulb provides amber light similar to a 60W incandescent bulb while generating less heat. It uses 5.5W and should be used only on 120V, 60Hz circuits. Light appearance: Brightness 500 lumens, Efficiency 90.9 Lumens/Watts, Energy used 5.5 Watts, Life 15,000 Hours, Colour rendering index (CRI) 80 CRI. The EcoSmart A19 8.5-Watt LED Light Bulb can be used to replace an traditional 60W incandescent A19 light bulb and emits an omni-directional light as well. This LED light bulb has an output of 800 Lumens and can last up to 25,000 hours, saving you up to $141.63 per bulb over the bulb's life. And it is suitable for use in table lamps, sconces, floor lamps and pendant fixtures. 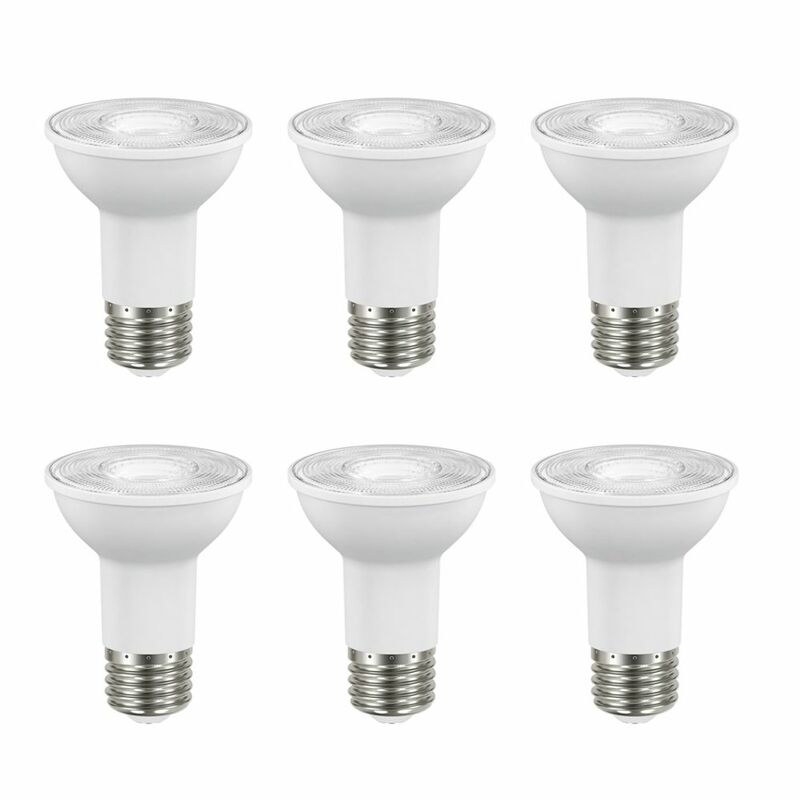 50W Equivalent Bright White (3000K) PAR20 Dimmable LED Flood Light Bulb (6-Pack) - ENERGY STAR® The EcoSmart PAR20 7-Watt LED Light Bulb can be used to replace an traditional 50W halogen PAR20 light bulb. This LED light bulb has an output of 450 Lumens and can last up to 25,000 hours, saving you up to $118 per bulb over the bulb's life. And it is ideal for use in track or recessed lighting fixtures. 50W Equivalent Bright White (3000K) PAR20 Dimmable LED Flood Light Bulb (6-Pack) - ENERGY STAR® is rated 2.2 out of 5 by 5. Rated 1 out of 5 by I am I from Don't last I purchased six pack of these October 24th. It is now December 31st and I just replaced the sixth one because it was blinking. That is correct, all six failed in just over 2 months. No dimming, occasional use. Save your money and do not buy. Rated 3 out of 5 by Niagara from Great LED lights, but affect my OTA TV Reception Had 5 of these lights in the kitchen ceiling for the past 2 years. Just cut the cord for TV and placed an antenna in the attic about 14' above these lights. Been fighting reception issues on VHF channel 9 and found my Antenna signal drops by 10% with the lights on. EMI from these lights cause picture to drop. Brand new antenna and high quality RG6 cables. Will have to replace these lights or watch TV in the dark. Rated 1 out of 5 by Rally_Really_Handy from Poor Choice When dimmed, they hum significantly more than other LED bulbs (all our house is LED for years now). Also, 2 of 20 failed within 10months (started flashing and needed to be replaced). Just avoid the brand. Rated 4 out of 5 by SuperS from Great for non-dimming applications Makes an audible buzzing sound when used with Leviton Type 6674 dimmer. Works great for on-off applications. Consistent colour. Rated 2 out of 5 by kate66 from Doesn't Dim well I have bought other LED lights with dimmer and they dim much more than this. And compared to the Halogens we have these barely dim. The light is also a fairly harsh light.